Jimmy Haughey is a graduate of Liverpool John Moores University, originally from the North West of Ireland. He has worked in South Korea, Japan, Indonesia, China and Vietnam, in varied roles including as executive director of a FTSE100 company, ground management and business acquisition. 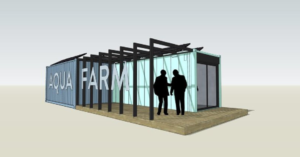 His vision for Liverpool AquaFarm is to demonstrate a modular, off-grid, aquaculture centre, to produce food in urban locations, using disused space. The test bed will be at Clarence Graving Dock in North Liverpool, carrying out R&D and producing fresh fish, seaweed and shellfish. Its future phases will focus an SME cluster and visitor destination to promote innovation and raise awareness of the sustainability agenda. Jimmy’s family has a long-running farm in the west of Ireland, which farms seaweed and cut turf alongside animals and land. 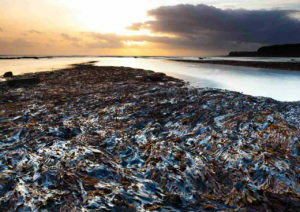 The seaweed, he says, is mainly used to feed the ground and for animal fodder, which he began to think of as an untapped resource. Setting up Seaweed Alchemy in partnership with the universities allows farming of seaweed from the family farm in Ireland, which can also be used for research purposes. ‘There are diverse prospects for products,’ he says. ‘Engagement with different species of seaweed allows different approaches to its use in health and wellbeing, in food and in wound management. Nature is a great healer and it can be used in the treatment of ulcers, which is a particularly expanding area with an ageing population. We’re now looking at how to improve these and create market products.’ Seaweed Alchemy is also involved with the Institute of Integrated Biology and transitional medicine. Jimmy’s skills are honed from his experience working around the world, and as an employee of one of the largest drinks companies in the world. Living and working in Africa and Asia has ‘culturally complemented’ his skills, he says, operating in cultures that are more innovation-led, often where smaller operations leading to innovation. He also talks about his journey from Irish coast farm to engaging with technology and a move to the city, which has given him direct access to a relatively untapped resource – the raw material of seaweed. Seaweed Alchemy currently collaborates with a number of organisations, including two institutes – charactering different types of seaweed, and in transitional medicine – and works alongside Liverpool City Council and Peel Holdings on Liverpool Aqua Farm, his OpenMaker finalist. OpenMaker, and the establishment of a LES (Local Enabling Space) is ‘the glue to take it forwards’, he says. ‘I was invited to an innovation workshop when I came to Liverpool. It allowed me to become part of enterprise partnerships – meeting Alex Kelly from Make Liverpool gave me an insight into what they were doing in the North Docks, and I came across OpenMaker through her. I appreciate the chance to meet like-minded people and new ways of working. ‘I’m interested in looking at personalised health as a long term approach, and at managing food sustainability and health and wellbeing in the shorter term,’ he says. ‘OpenMaker is a mechanism for taking the next step, and also enables long-term thinking with all the stakeholders in the process. It ratifies our thinking, and provides a positive badge. ‘In assessing whether we’ve been successful in the next nine to 12 months, our main criteria are the delivery of a demonstrator on the dock as a world first; creating a governance structure to align something that respects players as well as entrepreneurs, using communication and engagement as a business, and a proposed festival in June, giving us a wonderful place to shout about our project. ‘The opportunity,’ says Jimmy ‘is a real positive. The funders – whether they’re coming from government, regional or private – want something to happen. But universities have to get more involved – they need to have more conversations and impact. We need to “dirty the gown” and cut out bureaucracy. If we can keep it fluid we can keep it moving,’ he says.